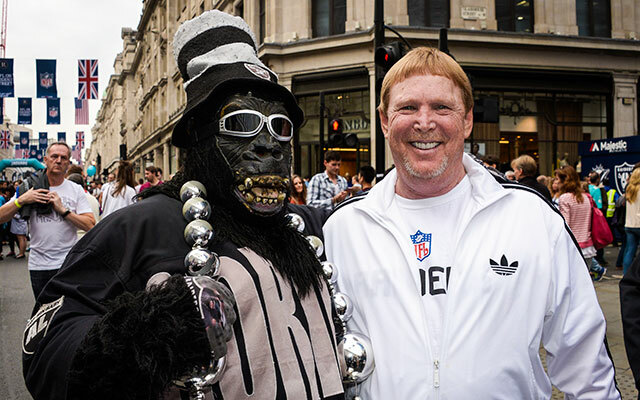 Mark Davis isn't your garden-variety NFL owner, who made his fortune elsewhere before deciding to buy a professional football team. Mark Davis became the Raiders' owner when his father, Al Davis, passed away in 2011. The team is 19-44 since, and Davis is the man ultimately responsible for getting this team back to the playoffs for the first time since the 2002 season. But Davis isn't your garden-variety NFL owner, who made his fortune elsewhere before deciding to buy a professional football team. Because of his father, he was raised with the Raiders, and he never really had a job until he inherited the team in his mid-50s. All this is covered great detail by ESPN's Tim Keown, whose exhaustive and entertaining story on Davis unearths some wonderful nuggets. Davis is worth roughly $500 million. When he visits his home in Palm Desert, Calif., Davis drives a $12-a-day rental car from the airport to save the $50 cab fare. Until nine months ago, when back surgery forced him to change his diet, Davis would spend Thursday nights with Raiders' fullback Marcel Reese and ex-Raider George Atkinson at Hooters for $12.99 all-you-can-eat-wings night. "They never charge us," Davis told Keown, "but it just feels better to say you're getting all you can eat for $12." In the mid-'80s, Davis invented the muff-style hand warmers and the slogan was, "Real Men Wear the Muff." Davis wears a fanny pack. Davis has a "2003 Nokia push-button phone with full texting capability." Davis drives a 1997 Dodge Caravan. And then there's the bowl cut. "In perfect Davis family fashion, it's a middle finger to convention," Keown writes. And Davis is well aware that his coiffure is a topic of conversation among fans and media. He also knows that people would like him to change it. "Every day," former Raiders great and Davis' friend, Cliff Branch said. "Every day. That's the No. 1 topic." And what is Davis' response? "He ain't changing it," Branch continued. "When people say something, he just laughs. The more they tell him, the more he's going to keep it. If they back off and don't say anything, he might change it."